The number of human genetic diseases unraveled by next-generation sequencing skyrocketed this year. Several factors contributed to this growth, two of which were the ever-increasing throughput of sequencing instruments and widespread availability of commercial exome platforms. A number of large-scale initiatives to discovery disease genes by exome sequencing, particularly for Mendelian disorders, got off the ground. I’d also argue that the rapid pace of discovery is also aided by a growing acceptance of sequencing as a clinical tool. A PubMed search restricted to keywords “exome” and “sequencing” and year 2011 returned over 100 publications, of which more than 60 were studies linking genetic variation to human disease. I’ve whittled the list down to around 40 and (after consulting a medical dictionary for most) divided them down by rough disease categories. The largest of these was what I call “developmental disorders” – mental retardation, dysplasia (abnormal growth), dyskinesia (impaired movement), and the like. There were at least 14 gene-disease associations published this year, many of them in the Americal Journal of Human Genetics. SMOC2 Major dental developmental defects Bloch-Zupan et al. AJHG. SYT14 Spinocerebellar ataxia with psychomotor retardation Doi et al. AJHG. TECR Non-syndromic mental retardation Caliskan et al. Hum Mol Genet. PRRT2 Paroxysmal kinesigenic dyskinesia Chen et al. Nat Genet. SERPINF1 Osteogenesis imperfecta Becker et al. AJHG. KIF22 Spondyloepimetaphyseal dysplasia with joint laxity Min et al. AJHG. KAT6B Say-Barber-Biesecker syndrome Clayton-Smith et al. AJHG. POP1 Novel skeletal dysplasia Glazov et al. PLoS Genet. CCDC8 3-M syndrome Hanson et al. AJHG. SLCO2A1 Primary hypertrophic osteoarthropathy Zhang et al. AJHG. WDR62 Recurrent polymicrogyria Murdock et al. Am J Med Genet A.
FAM20A Amelogenesis imperfecta O’Sullivan et al. AJHG. SHROOM3 Heterotaxy Tariq et al. Genome Biol. MCT8 X-linked leucoencephalopathy Tsurusaki et al. J Med Genet. Sequencing of individuals with hereditary cancer syndromes enabled the identification of some new cancer susceptibility genes. This category will undoubtedly explode in the coming year as thousands of cancer patients have their genomes or exomes sequenced. MAX Hereditary pheochromocytoma Comino-Mendez et al. Nat Genet. RET Familial medullary thyroid carcinoma Qi et al. PLoS One. Next up, metabolic disorders. Interestingly, a study by Vissers and colleagues linked germline variants in IDH1 — a gene recurrently mutated in leukemia, glioblastoma, and other cancers — to “metaphyseal chondromatosis”, a rare disorder of severe bone dysplasia, neurodevelopmental problems, and strongly increased secretion of D-2-hydroxy-glutaric acid. ACSF3 Combined malonic and methylmalonic aciduria Alfares et al. J Med Genet. and Sloan et al Nat. Genet. MTHFD1 Novel inborn error of folate metabolism Watkins et al. J Med Genet. IDH1 Metaphyseal chondromatosis with aciduria Vissers et al. Am J Med Genet A. Several inherited deficiencies of the blood and lymphatic system were linked to causal mutations. What I liked about this category was that half of the publications came out in “non-genome” journals — Blood and Haematologica — indicating that medical specialists in the field recognize the importance of (and in some cases, are already applying) exome sequencing to study such diseases. NBEAL2 Gray platelet syndrome Albers et al. Nat Genet. GATA2 Dendritic cell, monocyte, B and NK lymphoid deficiency Dickinson et al. Blood. MPL Familial aplastic anemia Walne et al. Haematologica. GJC2 Primary lymphoedema Ostergaard et al. J Med Genet. Neurological disorders win the prize for making me look up the layman’s term for virtually every disorder whose causal gene was pinpointed by sequencing this year. These include such genes as lipofuscinosis (excessive accumulation of lipopigments), paraparesis (lower limb paralysis), and dystonia (abnormal muscle tone leading to movement and stature problems). DNAJC5 Adult neuronal ceroid-lipofuscinosis Benitez et al. PLoS One. KIF1A Hereditary spastic paraparesis Erlich et al. Genome Res. GCDH Early-onset generalized dystonia Marti-Masso et al. Hum Genet. FA2H Fatty acid hydroxylase-associated neurodegeneration. Pierson et al. Eur J Hum Genet. AFG3L2 Spastic ataxia-neuropathy syndrome Pierson et al. PLoS Genet. BANF1 Hereditary progeroid syndrome Puente et al. AJHG. DYNC1H1 Dominant axonal Charcot-Marie-Tooth disease. Weedon et al. AJHG. New disease genes were identified for several muscle fiber diseases (myopathies), including cardiomyopathy (heart muscle deficiency, usually fatal) and ophthalmoplegia, in which the muscles that control eye movement are paralyzed. Interestingly, the two mitochondrial cardiomyopathy disease genes (MRPL3 and AARS2) reported both encode products required for mitochondrial ribosomal function (MRPL3 encodes a ribosomal sub-unit, while AARS2 encodes a t-RNA synthetase). MRPL3 Mitochondrial cardiomyopathy Galmiche et al. Hum Mutat. AARS2 Infantile mitochondrial cardiomyopathy Gotz et al. AJHG. RRM2B Progressive external ophthalmoplegia Takata et al. Genome Biol. BAG3 Dilated cardiomyopathy Norton et al. AJHG. The last disease category I’ll mention is that of vision (loss) disorders. A number of new disease-causing genes were identified this year, mostly by exome sequencing. Two studies were particularly interesting. First, Bowne and colleagues (including myself) identified a mutation in the RPE65 gene causing autosomal dominant retinitis pigmentosa. This gene had only been associated with autosomal recessive RP; finding that it acts in dominant fashion suggests previously unknown routes of disease pathogenesis and new therapeutic possibilities. Second, Shi et al linked mutations in the ZNF644 gene to high myopia (severe nearsightedness), a common cause of blindness. Have you ever heard of a ZNFxxx gene that actually does something? Most of the time, you look these up and it says “May be involved in transcriptional regulation.” It’s good to know that at least one of them serves a purpose, namely, keeping most of us from virtual blindness. RPE65 Retinitis pigmentosa with choroidal involvement Bowne et al. Eur J Hum Genet. MAK Retinitis pigmentosa Ozgul et al. AJHG. ZNF644 High myopia Shi et al. PLoS Genet. MAK Retinitis pigmentosa Tucker et al. PNAS. MYO7A Leber congenital amaurosis Wang et al. Hum Mutat. DHDDS Retinitis pigmentosa Zuchner et al. AJHG. And there you have it. The genetic basis of dozens of inherited disorders, pinpointed by next-generation sequencing. There is simply no plausible way to deny the importance of next-generation sequencing to advancing human health and medicine. One can only imagine what we’ll know by next December, as large federally-funded initiatives ramp up their efforts to systematically apply exome and whole-genome sequencing to inherited disorders. A few recent studies have sought to compare commercial exome sequencing technologies. These kits, which selectively target coding regions for next-generation sequencing, have matured rapidly over the past couple of years. I like the recent study out of Michael Snyder’s lab (Stanford)the best. In it, the authors compared three major exome platforms – Agilent’s SureSelect Human All Exon (50 Mbp), Roche/Nimblegen’s SeqCap EZ v2.0, and Illumina’s TruSeq Exome Enrichment – to each other and to whole-genome sequencing (35x), all for a single individual. First off, a comparison of the declared exome targets for each platform. A large number of bases (29.45 Mbp), presumably the “meat” of the exome are targeted by all three platforms. Individually, the platforms have 4-28 Mbp of unique target space. Agilent does better for Ensembl transcripts; Nimblegen has better coverage of miRNAs. These two platforms share more target space with each other than either did with the Illumina platform. This is primarily because Illumina goes after untranslated regions (UTRs). I can’t decide if this is an advantage or not. On one hand, it certainly appeals to the investigator interested in variation in UTR regions. On the other, that’s a lot to sequence. Indeed, the authors note that 50 million 2×100 bp reads yield only 30x coverage on the Illumina platform, compared to 60x for Agilent and 68x for Nimblegen. The authors performed exome capture and sequencing on a single sample – a healthy volunteer of European descent – using all three exome kits. Each exome library got one lane of 2×100 bp reads on the Illumina HiSeq 2000 (11 to 18 Gbp per library). BWA mapped 99% of these to the reference sequence, and some 10-15% were PCR duplicates. Overall targeting efficiency was measured using 80 million reads for each exome, and evaluating the fraction of bases covered at 10x, 20x, and 30x. The authors wrote “At all read counts and depth cut-offs, the Nimblegen platform enriched a higher percentage of its targeted bases than the other two platforms.” They attribute this efficiency to the higher-density, overlapping baits used by the Nimblegen platform. Unsurprisingly, all platforms demonstrated a marked reduction in coverage over high and low GC targets. At low GC (40% to 20%), however, the Agilent platform showed only a slight decrease in read depth, possibly due to fewer PCR cycles, longer baits, and/or the use of RNA probes that were unique to this platform. Detection of small sequence variants, especially SNVs, is a major goal of exome sequencing. Using the normalized ~80m read sets, the authors performed SNV detection (using GATK) in each exome. All three platforms showed high concordance between SNV calls and high-density SNP array genotypes. The reference allele was slightly favored (0.53-0.55) at SNP positions, suggesting slight mapping bias against variant-containing reads. However, there were no biases toward or against specific substitution types. For all platforms, the SNV count increased as the coverage increased. This increase was not linear, however; at 30 million reads, over 95% of SNVs were detected. In shared regions, Nimblegen consistently captured the most SNVs and became saturated with the lowest number of reads. Nimblegen also detected the most indels in shared and RefSeq regions, owing to more efficient capture and thus deeper coverage. At low read counts, Agilent detected more indels in shared regions, but at 50 million reads, Illumina surpassed Agilent (and, unsurprisingly, detected many more UTR indels). Most indels were 1bp in size, though the authors saw slight enrichment of indels in the 4bp and 8bp bins (consistent with human-primate genome comparisons), as well as the multiple-of-three enrichment expected due to selection against frameshift mutations. A key strength of this study was that the authors also performed whole-genome sequencing to 35x mean coverage on the sample that was evaluated. WGS data had 98.5% concordance at heterozygous SNP positions as detected by SNP array. To simulate the multiplexed sequencing of 3 or 6 exome libraries per lane (GAIIx or HiSeq, respectively), the authors normalized exome datasets to 50 million reads apiece. In each exome-WGS comparison, the WGS dataset was restricted to regions targeted by that exome product. This step seems necessary for an apples-to-apples comparison, but I should note that it minimizes the strength of WGS, which provides relatively unbiased coverage across all coding regions. In other words, this restriction slightly favors the exome dataset by examining only regions that its platform was willing, and able, to target. The vast majority of SNVs in exome space were detected by both exome and WGS data, but there were some differences. Notably, the exome-specific and WGS-specific calls in each comparison tended to have (1) lower confidence scores, (2) higher proportions of novel-to-dbSNP variants, and (3) better coverage in the detection platform. WGS-specific SNVs often had zero reads in the exome data (probably hybridization failure). In contrast, most exome-specific SNVs had coverage in WGS, though it tended to be lower. It seems clear from this figure that the number of SNVs detected by exome and WGS is correlated to the “reach” of the exome platform. Illumina, which had the biggest target space and also went after UTRs, had the highest number of shared SNVs. Agilent had more than Nimblegen, but Nimblegen’s sensitivity for true positives in its target regions was much higher than that of the other two platforms. The authors conclude that all three exome platforms are pretty good. Choosing among them probably depends on the goals, priorities, and budget of the investigator. 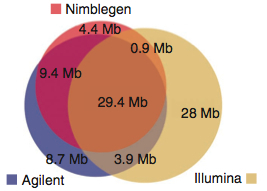 For the cost-conscious, Nimblegen offers the most efficient enrichment of exons (and also of miRNAs). For the variant-hunters, Agilent provides a wider reach but requires a bit more sequence data. Illumina requires the most sequence data, but it alone surveys untranslated regions, which might appeal to some researchers. A study published online at Nature reports the identification of three recurrently mutated genes by whole-genome sequencing of four cases with chronic lymphocytic leukemia (CLL). This is the most common adult leukemia in western nations, with two major subtypes distinguished by somatic hypermutation of the immunoglobulin heavy chain (IgH) variable region. Led by Xose S. Puente of Universidad de Oviedo in Spain, the authors applied a combination of whole-genome sequencing, exome sequencing, and long-insert library sequencing to tumor samples and matched (normal) controls from two patients of each subtype. Puente et al identified roughly 1,000 somatic mutation per tumor in unique regions, estimating a mutation rate of less than one per 1 megabase. This is consistent with other leukemias, although (to my disappointment) the authors failed to refer to the first two sequenced leukemia genomes, AML1 (Ley et al, Nature 2008) and AML2 (Mardis et al, NEJM 2009), which I’ve cited below. In these four CLL cases, the most common substitution was G>A / C>T, which usually occurred in a CpG context. Interestingly, the mutation spectrum differed between subtypes; IGHV-mutated cases showed a higher fraction of A>C / T>G substitutions, and often A>C mutations occurred at adenines preceded by a thymine. The context and patterns of mutations in IGHV-mutated cases was consistent with error-prone polymerase during the normal process of somatic hypermutation of IGHV genes. Class 3 mutations, comprising everything else. Summarized in the above fashion, these mutation counts are similar to the number observed in AML1 (n=10) and AML2 (n=12). The relatively small number of somatic coding mutations in leukemia is just incredible. NOTCH1 (12% of cases), a key signaling molecule involved in developmental processes that controls cell fate decisions. The observed mutations generate a truncated protein lacking the PEST sequence, which was constitutively activated and more stable than the wild-type isoform. NOTCH1-mutated patients had more advanced CLL at presentation. MYD88 (2.9% of cases), an effector molecule for IL1 and TLR receptor signaling. In mutated cells, activation of IL-1 or TLR signaling triggered a dramatic over-production of IL1RA, IL6, CCL2, CCL3, and CCL4. The high production of these cytokines is known to recruit macrophages and T-lymphocytes, creating a favorable micro-environment for tumor survival. Indeed, patients with MYD88 mutations were diagnosed at a younger age, and with more advanced tumors. XPO1 (1.1% of cases), which encodes exportin 1, a protein implicated in the nuclear export of proteins and mRNAs (including MAP kinases). Notably, all four cases with this mutation were of the IGHV-unmutated subtype and had NOTCH1 mutations, indicating a possible synergistic effect between mutated NOTCH1 and XPO1. KLHL6 (0.8% of cases), which plays a role in germinal center formation during B-cell maturation. The three mutated cases harbored multiple point mutations, consistent with somatic hypermutation. Based on functional and clinical analyses, the authors conclude that mutations in NOTCH1, MYD88, and XPO1 are oncogenic changes that contribute to the clinical evolution of CLL. Using paired-end sequence data and a basic analytical approach, the authors identified ten somatic structural variants (SVs), most of which were known events in CLL. Three of four cases harbored a deletion of 13q14; the minimally-deleted region includes several genes and a couple of micro-RNAs. This is a known lesion in CLL, and was not pursued further in the main text. From the copy number data in Figure 1, it is clear that these CLL genomes harbor relatively few genomic rearrangements, which is again consistent with what we’ve seen for acute leukemia. The authors mention that they employed not just WGS but exome sequencing, though the latter finds no place in the main text. Looking through the supplemental materials, I found that some 42 mutations were identified and validated by exome sequencing. Of these, 37 were found using WGS data, suggesting a sensitivity of ~88% for somatic coding mutations. All mutations were manually reviewed to remove common sequencing- and alignment-related artifacts. Some validation was performed using PCR and Sanger sequencing; among the 86 class 1 / class 2 variants for which PCR and Sanger sequence data were obtained, 83 proved to be valid somatic mutations. An additional 384 random mutations (96 per tumor) underwent validation as well, and 96% of these were validated. This is an impressive specificity, though I would attribute it to the manual review process, which may not scale to genomes with more than 10-20 somatic mutations.